The smooth hard zones move through the hand like wheels when repositioning the hand on the handle. The easy-to grip soft zones provide optimal contact zones for the muscles of the hand and facilitate high torque transfer. The tool for jobs involving stainless steel elements or stainless steel screws. The blade is made from 100% stainless steel and protects against extraneous rust, which is transferred when using non-stainless steel tools on stainless steel. The stainless assortment includes also bits, bit-holders and hex-keys. The extremely rough surface bites into the screw head ensuring that the screwdriver is held securely in the screw. As a result of the reduced cam-out effect much less axial pressure is required. Available in the series Kraftform® stainless and Kraftform® Plus. Significantly reduced fastening times in the electronic and light engineering sector. Cost reduction per screw application. Precise, powerful, fast and ergonomic fastening based on a three-zone design with precision, power and fast-turning zones. Bits insert easily and self-lock. Bits are easily removed without the use of extra tools. Free-spinning outer sleeve stabilizes the power tool screwdriver during the screwdriving process. Fits all 1&Mac218;4" bits according to DIN 3126 C 6,3 and E 6,3. One-hand use. Even small blades are changed easily. New: Rapidaptor® with ring magnet. The additional ring magnet also holds long and heavy screws securely. A secure connection between screw and holder. No need to waste time on looking for lost screws. Ideal for overhead work. Includes bits that are integrated in the handle. With removable bayonet blade that can be used as a power tool adaptor. Universal holder with Rapidaptor® technology. A safety tool in a compact design. According to VDE norm (IEC 60 900 : 2004, DIN EN 60 900). Kraftform® handle and interchangeable blades in a handy pouch. For fastening, chiselling and loosening seized screws. With impact cap and pound-thru blade. Ergonomic Kraftform® handle. Tools with holding function. Secure hold in the screw. No need to waste time on looking for lost screws. Perfect fit in the screw. A special tempering process reduces the hardness of the shaft of BiTorsion® bits compared to the drive end. The torsion zone cushions higher impacts. An integrated torsion spring in the BiTorsion® holder absorbs smaller impacts. Contents are easily visible. The box is thinner than the thickest item it contains. Required tools are spotted immediately. Tiny diamond particles bite into the recess of the screw. The diamond coating reduces the cam-out forces which reduces the required contact pressure. Secure fit in the screw. No slipping out of the screw when using power tools. L-keys fixed securely in the clip. No wear. Easy removal. Great durability due to solid rubber material. Extends the service life of hexagon socket screws. 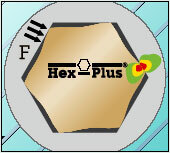 The unique Hex-Plus profile helps to transfer the driving stress more evenly to the screw recess, reducing the damaging notching effect. No more incorrectly tightened screws. With adjustable and pre-set torque. Controlled tightening for each fastening process. Prevents destruction of screws. Excellent value for money. Ergonomic Kraftform® handle.